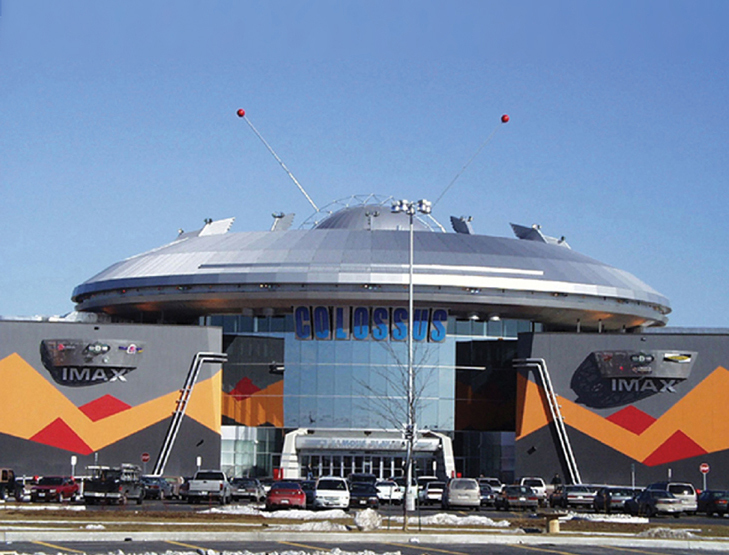 This eighteen multiplex cinema, with an additional Imax auditorium, was the first of its kind to be built in Canada. It is located in the City of Vaughan which borders with the north-west limits of the City of Toronto. 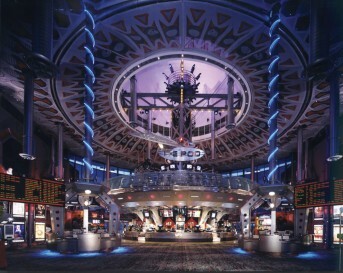 There are nine cinema auditoria to the north of the central circular rotunda, and nine cinema auditoria to the south of the circular rotunda, with the Imax theatre at the east of the rotunda. In addition to housing the ticket booths and ticket dispensing machines, there is a central circular refreshment dispensing area in the centre of the rotunda. A four sided structural steel tower, which is exposed to view, rises from the precise centre of the rotunda, through the refreshment vending area, and the bar area above, to support the main truss system at the high roof level of the rotunda. Above the roof of the rotunda, there is a decorative “flying saucer like” structure clad in steel deck siding. The non structural interior masonry walls, which provide sound attenuation between the auditoria, and the perimeter precast wall panels, which are part of the building envelope, along with the glass and aluminum curtain walls of the rotunda are supported on reinforced concrete grade beams spanning between caissons, which are carried down to sandy silt till, capable of safely sustaining a pressure of 1440 kilopascals, ie. 30096 pounds or 15.05 tons per square foot. Within the envelope of the insulated precast wall panels, the structure is a steel frame, with the columns, arranged within the walls separating the auditoria, supporting steel beams above the walls and steel trusses which span the width of the auditoria, which in turn support 400 mm deep open web steel joists, and 38 mm deep by 0.76 mm, thick steel deck. The roof of the rotunda is carried on five major structural steel trusses, a 1000 mm deep welded wide flange steel beam, two 700 mm deep welded wide flange beams, and eight 600 mm deep wide flange beams, all of which support steel purlins and 38 mm deep by 0.76 mm thick steel deck. The reinforced concrete structure, in the centre of the rotunda, which supports the bar above the refreshment dispensing area was awarded honourable mention by the Ontario Ready Mixed Concrete Producers Association.